Instead of trying to build a better computer mouse, some researchers are developing an interface that would allow users to control computers with their minds. A team at the University of California in San Diego suggests that using flexible electronics, stuck to the forehead like temporary tattoos, can make it possible to measure neural signals in a painless, non-invasive way. 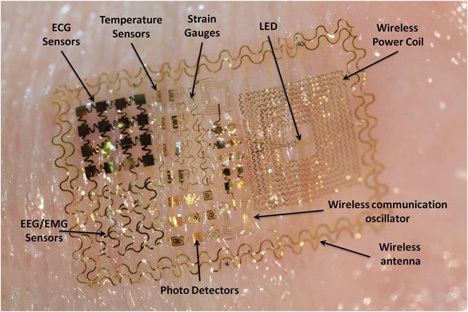 The flexible electronic bits are less than 100 microns thick and capable of moving, folding and bending along with the skin. They are placed on the forehead without gel and easily pick up on electrical signals and brain activity. Powered by solar cells, the small sensors contain antennae for communicating commands from the mind to nearby machines. Besides just translating brainwaves into computer commands, these ultra-thin electronics could tell us everything we need to know about ourselves and our world. They could measure heart rate and activity, keep an eye on premature babies, and even sound a warning when a wearer is about to have a seizure. See more in Cybernetics or under Technology. February, 2013.